This is a special one bedroom hideaway just a five minute walk to downtown. The home is a fully equipped: Wi-fi, Smart TV, DVD, Bluetooth sound system, guest bath with shower and waterfall sink, all season sun porch has six windows( which open) furnished with a futon couch and a comfortable chair. The bedroom has an en suite bathroom with a hand crafted vanity/travertine top,a pocket door closes off the walk-in closet which also contains a full size washer/dryer.Calm color palette and local art throughout.For extra guests, there is a pull out sofa bed in the open concept living space. Dining area seats four. Barn doors separate the bedroom from the living area. Gorgeous kitchen: honed granite counter tops, gas range, microwave, coffee maker, Capresso hot water kettle, Bosch dishwasher, pots/pans, dishware and cutlery.There is also a blender,small espresso machine and hand mixer. Outside of the slider doors is a small deck with table and chairs as well as Adirondack chairs/table in the yard. (Hammock during the warmer months.) Air conditioner installed during the summer, always available is a powerful Dyson rotating fan with remote. There are some dvds, cds, books and games. Information about the area including restaurants can be found in three scrapbooks. (Designed with the comfort of adults in mind, not a suitable property for children under 12.) We ask that footwear be removed on the porch and unfortunately we cannot accommodate four legged family members. No open flames of any sort including portable grills outside. No smoking anywhere on the property please. The house is suitable for long term stays-all you need are your personal belongings. We are former flight attendants who had a fantastic time restoring what was a three bedroom/one bath 1920's cottage into what you see today.Russ hails from BC, Canada and Seattle, WA. Kerrie is a Queens, NY/ west coast hybrid.We are relatively new to Vermont having moved from the West coast in 2008. Brandon is an amazing place; our dart fell in the perfect spot! By utilizing the talents of local craftspeople and artists we ended up with a lovingly restored, unique and special hideaway. Three years of hard work yielded a satisfying result which we are proud to offer as a home away from home for you to enjoy. Window unit will be provided if you would like to have it. Dyson high powered fan in the mean time which seems to do the trick. ( Some of the time, the pillows have shams for decorative purposes. Please remove before using.) Bed is made up with freshly laundered linens. Duvet cover is washed after every guest. Please clean lint trap frequently. Proactive type cleansers take the dye out of the towels. We supply white towels in the vanity drawer for facial product users. Otherwise, plenty of bath sheets/wash cloths and extra towels. Let us know if you will be needing the use of the sofa bed-we rearrange the living area to accommodate it. Bosch. We supply starter detergent and rinse aid. Gas and has a film on the rack which should be left in place while baking. Pizza stone in the bottom drawer along with its metal holder. Instruction manual in the LH Handbook. Reusable cover within. Tea, coffee, hot chocolate, microwave popcorn, Brita filtered pitcher in fridge. Salt and pepper,sugar,mini moos. Settings for six. Wine and champagne glasses. Cooking utensils by the stove and in drawers. Electric kettle. Will get white residue from minerals in the water. Use white vinegar to clean. Cotton place mats and a table cloth stored in the kitchen. The dining table is shabby chic hence rings/marks are normal. Clear wax finish will melt if a laptop does not have a mat underneath it. Smart TV. You can access your Netflix account-sign-in as guest. See LH Handbook. Two remotes are involved. An old Trivial Pursuit, cards, backgammon, checkers. Paltry....but our library loans DVDs...let the librarian know you are our guest. Small two seat patio set on deck. Our business insurance insists on: no outdoor grills/cooking. No open flames of any sort. We deeply discount our rates for stays of three months or longer. Please ask. Perfect spot to have a romantic retreat. Great place for a solo respite. We do cater you first morning's continental breakfast: pastry, juice, yogurt and fruit. Let us know if we can lend you anything you may have forgotten or if there's a kitchen appliance you are in need of. Cutting boards to be used on the granite please. Oven liner remains in oven when baking. Quaint, quiet, and very clean! We stay here every year visiting family close by. It has become our little home. It is perfect! This was our second stay at The Little House. Kerrie and Russ were so welcoming and they let us know what was going on around town. As expected, the house was immaculate and was stocked with everything you would need. A nice assortment of pastries from the local bakery (which has very tasty goodies), juice and yogurt for breakfast were waiting. We knew we wanted a relaxing vacation, and The Little House fulfilled all our expectations. Such a peaceful neighborhood and comfy bed!! The center of town is a short distance (walkable), and there are a few stores and restaurants as well as a grocery store. We had a great breakfast at Mae's and a fantastic dinner at Cafe Provence!! There are plenty of places to take day trips to, and then come back to The Little House to wind down. As I said before, they thought of everything, just bring your clothes and food if you like to eat in. Thanks, Kerri and Russ for a great vacation!! See you next year! Kerrie and Russ have created the perfect home away from home. All the amenities, super comfy bed, quiet, charming. The pastries and fruit and wine were so thoughtful. I wish we had found this place sooner for visits to our kid at Middlebury. Now that she has graduated we will have to find a reason to come back. Truly the sweetest little house we've ever rented. Thank you K and R for sharing it with us! I wish you had found us sooner too...we very much enjoyed meeting you and Art. Thank you for the great review ( and for the lovely bottle of wine!). I hope you weren’t sick for the remainder of your trip-and truly no need for tissue reimbursement; too kind. If your daughter remains on this coast, perhaps Vermont will become your rendezvous point. And we will get to welcome your family again. Lucky us! The house is a wonderful place. It has all the accommodations of home. The owners are very nice people. I would stay again. We thoroughly enjoyed our stay at Kerrie and Russ's place in VT. The house has been lovingly restored and is very comfortable. It was spotlessly clean and well appointed with everything you could possibly need. Little touches - a Christmas tree and gift, wine, cookies, pastries, yogurt, juice - made the house welcoming. The attention to detail was special. Kerrie and Russ's enthusiasm for Brandon and VT is evident. This is a special place. We'll be back! Thank you so much for the terrific review. We are so glad you enjoyed your stay; holiday getaways are special and we wanted to make it memorable for your family. See you next time! This cute house was better than the pictures! The attention to detail was Amazing. The house was impeccably clean. Bed was so comfortable. Bathroom was so clean and laundry room a plus! It felt like I was in my own home. The pastries we were left to enjoy were wonderful. We even took a nap on the hammock Sunday morning. Center of town was 2 mins away with great little restaurants. 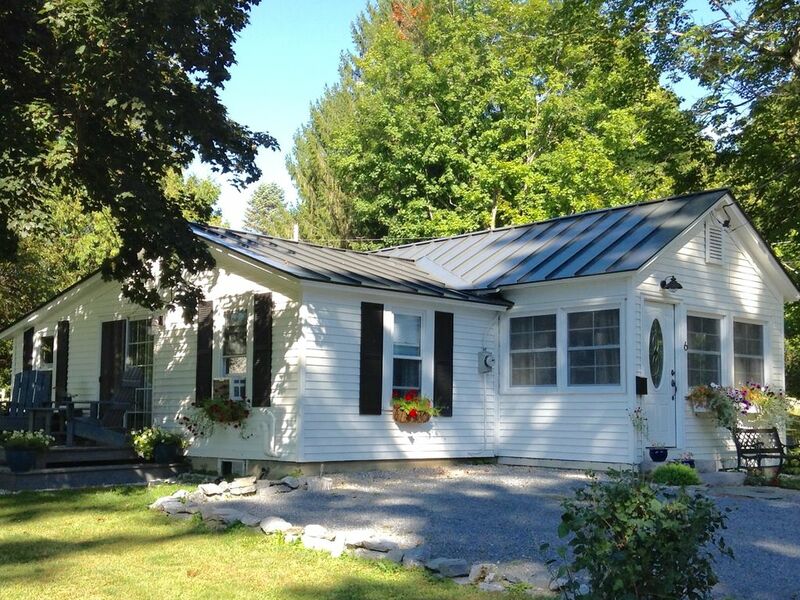 I cant wait to book this little house on my nxt trip to Vermont. Thanks again Kerrie! Thanks for the rave review Michelle! We never tire of hearing how much our guests love TLH as much as we do. Looking forward to welcoming you back! We are at the foot of the Green Mountain Wilderness area. Great hiking, cross country skiing, lake activities. ( There is an activity book with maps in the house) The Neshobe River and Otter Creek create two waterfalls in the center of town. The Stephen Douglas Museum is located in his childhood home at the north end of town. Brandon is central to Middlebury, Woodstock and an hour's drive to Burlington. The local arts scene is very active: The Brandon Artists Guild hosts many local talents and music is not to be missed when it is played at Brandon Music. On Demand programming is on the honor system, though most is free. (Price plus 10% to cover Xfinity's outrageous fees and tax of course.) Your rate includes VT 10% lodging tax. No smoking in or on the property please. And no outdoor footwear in the house;bring slippers or warm socks! No smoking anywhere in or on the property. And please no open flames including portable grills, fire pits or candles.Starter paper goods/laundry supplies provided. Pls. apply sunscreen/bug spray outside. Suitable for well behaved children 12 and up. The House handbook answers most questions located on the dining table.